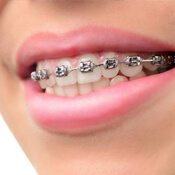 Traditional metal braces have been around for decades; throughout the years, they have helped countless individuals to achieve smiles that are both beautiful and healthy. Although modern orthodontics offers a few alternatives to traditional braces, they are still an effective and convenient way to correct alignment problems. Your teeth are anchored in your jawbone via ligaments, which allows them to have a bit of natural mobility. By applying continuous gentle pressure to teeth, braces leverage that mobility to gradually reposition your pearly whites. If traditional braces are a fit for your situation, you’ll have a banding appointment; this is when your orthodontist installs the brackets and wires that will move your teeth. The appointment may take a couple of hours. Later, you’ll have to come back to our office every four to six weeks so your braces can be adjusted; these appointments should only take about 20 minutes or so. 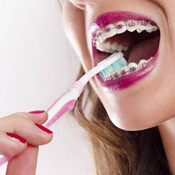 Overall treatment time with braces varies from person to person. It may take anywhere from several months to a couple of years, depending on how far your teeth need to move. Straight teeth fit together well, which decreases the chance that they will hit one another at odd angles and become broken or chipped. A well-aligned bite reduces your risk of suffering from TMJ disorder. Straight teeth are easier to clean than crooked ones, which means that you will be less likely to suffer from tooth decay and bad breath. They can correct a broad range of orthodontic issues, including severe problems that alternative treatments might not be able to address. You can have fun with them! 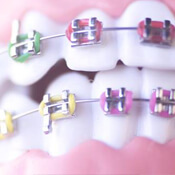 You can choose your favorite color for your brackets and rubber bands. Of course, if you want a more discreet appearance, neutral hues are also available. They are quite strong, so the chances that your braces will break are minimal. They are among the most affordable orthodontic treatments. Once your brackets and wires are in place, you’ll have to make a few simple adjustments to your daily routine so you don’t accidentally damage your teeth or your braces. You may have to avoid certain foods, such as things that are sticky or hard, and you’ll need to be extra diligent about oral hygiene. When you visit your orthodontist for a consultation, they can give you more details on how you can care for your smile throughout your treatment. Would you like to speak with an orthodontist about traditional braces or other treatments that can help you achieve a straighter smile? Contact us today!